Southwest Dumps SeaWorld: How Many Clicks Did It Take? If you’re a regular reader of this blog (well, of the blogs I infrequently post here, anyway), you know that I’ve written a couple times about the power of online activism – notably here and here. While there are other forms of advocacy I prefer, I don’t think there’s any question that online petitions have become an influential force in the movement. We need look no further than SeaWorld for evidence. 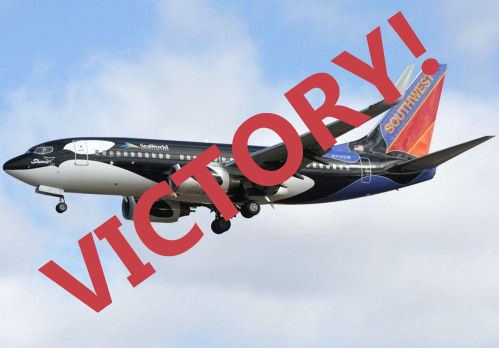 Yesterday’s news that Southwest Airlines is ending its quarter-century relationship with SeaWorld came as a surprise to no one who has noted the growing popularity – and power – of petitions hosted on social-change platforms like Care2 and Change.org. Southwest’s marketing partnership irked many of its customers, leading some to boycott the airline altogether. One such customer was Robin Merritt, who launched a petition on Change.org calling on Southwest executives and its board of directors to dump SeaWorld. “Southwest Airlines has a choice,” read the petition. “Will it support the animal cruelty at SeaWorld or make a compassionate choice to end this partnership of cruelty?” More than 32,000 people signed the petition with a simple click, and the air carrier finally made the compassionate choice. This was just the latest in a string of anti-SeaWorld victories animal advocates have been celebrating in recent months, and let’s be honest, we owe a lot of thanks to Blackfish – that heart-wrenching 2013 documentary that is turning the tide against animal captivity. The film has not only raised public awareness about the plight of confined and exploited marine mammals, but it’s inspired scores of everyday animal lovers to launch online petitions against SeaWorld and other businesses that keep animals. And we’re experiencing a sea change. Oh, and after your victory, don’t forget to do what Robin Merritt will do this weekend: celebrate!